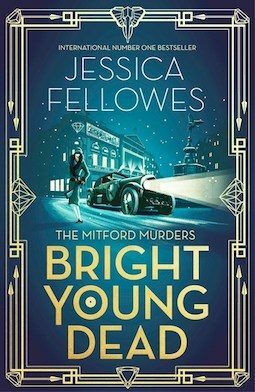 Last year I reviewed The Mitford Murders by Jessica Fellowes…. which I described as ‘faction’…. a fictional account of a murder set around real life characters and events. I’d not heard of the Mitford sisters at the time and was somewhat intrigued. Meet the Bright Young Things, the rabblerousing hedonists of the 1920s whose treasure hunts were a media obsession. One such game takes place at the 18th birthday party of Pamela Mitford, but ends in tragedy as cruel, charismatic Adrian Curtis is pushed to his death from the church neighbouring the Mitford home. I actually enjoyed this second instalment in the series more than I did the first. I am assuming there will be more, but the ending here is a little interesting, so we’ll see. I think my enjoyment of this book centred around the fact that Louisa seemed more the mystery-solver this time around. I felt she got a little lost around Nancy and her sisters in the first book and I engaged more with them than Louisa but it was different this time around. Several years have passed since the first book. Louisa is 23 and still a nursery maid to the younger Mitford children. Nancy is now 21 and younger sister (Pamela) who plays a greater role than I recalled from the first book, is turning 18. Again I struggled a little with the lack of consistency in Nancy’s character towards Louisa (Lou-Lou when they want something). On occasions she almost treats her as an equal, other times most certainly putting her in her place. Of course it may well be that way on purpose, to reflect reality… the lack of consistency in a the upper class’s treatment of the ‘help’ and how confusing it must be to someone like Louisa who isn’t sure where she stands. Indeed, Louisa starts to ponder a life outside of the Mitfords. Guy’s moved from the railway police into the real police force (is a sergeant with London’s Metropolitan Police) but stuck at the front desk and yearns to get out from behind it. His boss though, doesn’t seem to have a lot of faith in him so when Guy finally gets his chance (joining the hunt for a notorious female criminal heading up a gang of thieves), he gives it all he can. He teams up with a female police constable (Mary Moon) who’s even rarer than the likes of young Jane Tennison (50yrs later!). And of course, Louisa ends up relying on Guy to help her clear the name of Dulcie, who she’s befriended, and the two cases intersect. I got slightly lost in terms of the goodies and baddies and gangs of women vs men at one point and didn’t understand why a whole group of people ended up attacking a house and its inhabitants… (though ultimately it didn’t really matter). I also was a bit perplexed as to why Fellowes had leapt forward four years since the first book. I wondered why… it felt as if Louisa, Guy and Nancy were not changed much at all, though surely things would have happened during that time. Of course it may have been done to fit with historical facts as again Fellowes has done her research, with some of our key players and their misdeeds based on real life characters – here there’s the ‘Queen of the Forty Thieves’ (head of a female gang, Alice Diamond) and a few side characters involved in nightclubs and the like. This is a light and enjoyable read – a cosy and quirky mystery reminiscent of Agatha Christie or Kerry Greenwood’s Miss Fisher. As I mentioned earlier, there’s a bit of a shift at the end of this novel but I’d be surprised if this is the end of the series, so I’m keen to see where Fellowes takes us next. Bright Young Dead by Jessica Fellowes was published in Australia by Hachette and is now available.